The United States could have three more megacities (metropolitan areas over 10 million) by 2042, according to population projections released by the United States Conference of Mayors (USCM). Chicago, Dallas-Fort Worth, and Houston are projected to join megacities New York and Los Angeles as their metropolitan area populations rise above 10 million. At the projected growth rates, Atlanta, Miami, Phoenix, and Riverside-San Bernardino could pass the threshold by 2060. The population projections were prepared for USCM by Global Insight IHS. 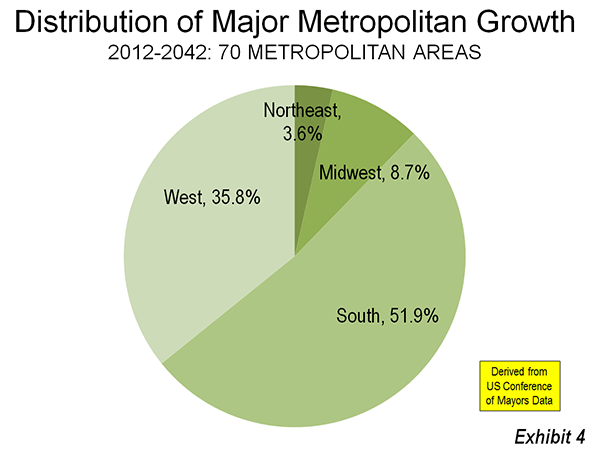 USCM anticipates that the number of major metropolitan areas – those over 1,000,000 population –- will rise from 51 in 2012 to 70 in 2042 (Note). The additional 19 major metropolitan areas range from Honolulu, which should exceed the million threshold next year, to Colorado Springs. California would add four new major metropolitan areas, including Fresno, Bakersfield, and Stockton from the San Joaquin Valley and Oxnard, which is adjacent to Los Angeles. Texas would add two, McAllen and El Paso, as would Florida (Cape Coral and Sarasota) and South Carolina (Columbia and Charleston). The top ten rankings would change relatively little. The top five would continue to be (in order), New York, Los Angeles, Chicago, Dallas-Fort Worth, and Houston. But the relationships would change materially. Dallas-Fort Worth would trail Chicago by only 30,000, much reduced from the 2012 gap of 2.9 million. If the annual projected growth rate were to continue another year (to 2043), Dallas-Fort Worth would take third position from Chicago, ending more than eight decades in that position. Houston also is forecast to gain substantially on Chicago, from a deficit of 3.3 million in 2012 to only 900,000 in 2042. If the respective annual growth rates were to continue, Houston would bump Chicago to fifth place by 2050. Atlanta would move up three positions to number 6, and could be the nation's 6th megacity before 2050. Miami would move from 8th to 7th. There would be two new entrants to the top ten: Phoenix and Riverside-San Bernardino, ranked 8th and 9th. These two, along with Miami could become megacities before 2060. The tenth position would be held by fast growing Washington, which would remain the only non megacity in the top ten. 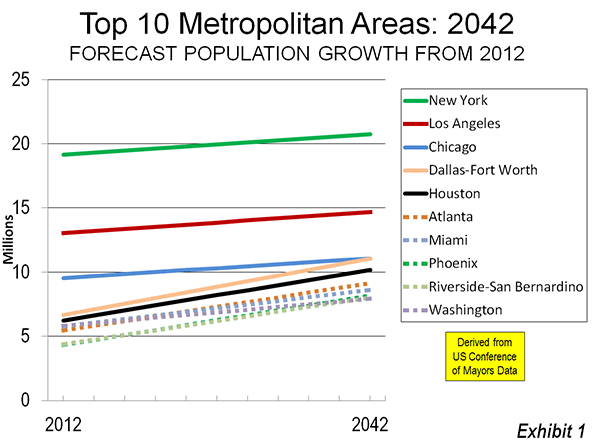 Seven of the top ten metropolitan areas in 2042 are forecast to grow very rapidly. Phoenix and Riverside-San Bernardino are projected to grow at annual rates of 2.1 percent and 2.0 percent respectively, approximately three times the 2012-2042 national growth rate projected by the US Census Bureau (0.7 percent). Atlanta, Dallas-Fort Worth and Houston would grow at 2.5 times the national rate (1.7 percent), Miami nearly double (1.3 percent) and Washington at 1.5 times the national rate (1.0 percent). Washington is technically in the South, which according to the US Census Bureau begins at the Mason-Dixon line, or the Pennsylvania-Maryland border. This means that all of the fast growing top 10 metropolitan areas are in the South or West, a pervasive trend discussed later in this article. 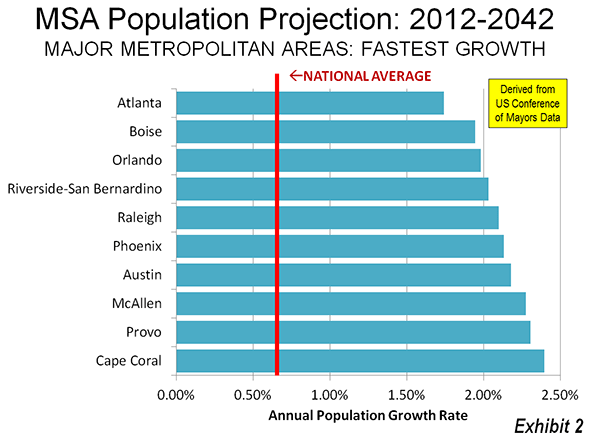 Meanwhile, the three largest metropolitan areas would have well below average growth. New York would grow the slowest, at 0.3 percent. Chicago would grow at 0.5 percent annually, faster than Los Angeles, a national growth leader for a century, which would grow at only a 0.4 percent annual rate (Figure 1). Four of 2042's major metropolitan areas would lose population from 2012, including Buffalo, Cleveland, Detroit, and Pittsburgh. Hartford, Rochester, Milwaukee, and Providence would grow at less than one-third the national population growth rate. New Orleans and New York would round out the bottom ten, growing at an annual rate of approximately 0.25 percent (Figure 3). Though Los Angeles is not among the bottom ten (it would #13), it is notable that its growth rate is projected to be slightly less than St. Louis, long a laggard, and only slightly better than Philadelphia. Philadelphia has been losing position regularly since it was the nation's largest city, before the first US census (1790). According to the USCM projections, the overwhelming majority of major metropolitan area population growth (70 areas) will occur in the South and West. Approximately 51 percent of the major metropolitan growth is expected in the South, which would add 33 million residents. The West would capture 36 percent of the growth, while adding 22 million residents. The Midwest would capture only 9 percent of the growth, adding 8 million residents, while the Northeast would take 4 percent of the growth, while adding only 2 million residents (Figure 4). The South would grow at an annual rate double that of the national 0.7 percent rate (1.4 percent). The West would be close behind (1.2 percent). However, if the major metropolitan areas of coastal California were excluded from the West (Los Angeles, San Francisco, San Diego, and San Jose), the West would grow even faster than the South (1.6 percent). Coastal California's annual growth rate is projected at 0.6 percent, below the national average of 0.7 percent. The Northeast and the Midwest would both grow at less than the national growth rate (0.2 percent and 0.5 percent respectively). The fastest growing metropolitan area in the Midwest is projected to be Indianapolis, at a respectable 1.2 percent growth rate (ranking 32 out of 70). Midwestern Omaha, Kansas City, and Columbus would also grow faster than the nation. The fastest growing major metropolitan area in the Northeast would be Philadelphia, which would add only 0.3 percent to its population annually (ranking 59th). Philadelphia would add only slightly more residents than Provo, Utah, despite being more than 10 times as large in 2012. Projecting anything can be risky. Unforeseen circumstances could result in a materially different future than forecasts suggest. No reputable forecaster, for example would have predicted during the 20th century that North Dakota would become the nation's fastest growing state in the early 2010s. Upstate New York, for example, could experience an economic turnaround if state allows them to take advantage of hydraulic fracking. 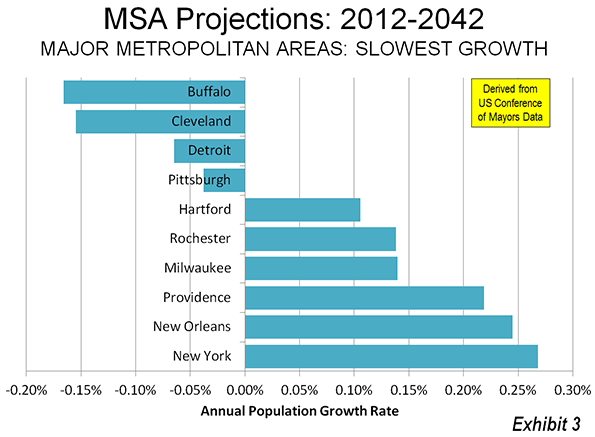 The long-suffering Buffalo and Rochester metropolitan areas could rise well above current expectations. It is probably far too much to expect any major material progress in California, with a business climate so colorfully dismissed by The Economist in its current edition (see The Not So Golden State). The USCM projections to 2042 indicate a continuation of geographical trends that have been strengthening virtually every decade since the middle of the last century. Barring any sea-changes, they are more likely to be more right than wrong. Note: The USCM projections were prepared before the revision of metropolitan area boundaries in 2013. This revision added Grand Rapids as the 52nd major metropolitan area. Had the new definitions been available, Grand Rapids would have been the 71st major metropolitan area. Generally, there were only minor changes in the major metropolitan area definitions, the most significant being New York, Charlotte, Grand Rapids, and Indianapolis. Wendell Cox is a Visiting Professor, Conservatoire National des Arts et Metiers, Paris and the author of “War on the Dream: How Anti-Sprawl Policy Threatens the Quality of Life. Does this adequately factor in recent spatial constraints? Submitted by PhilBest on Thu, 01/30/2014 - 04:31. I say that any city that has hit a spatial growth constraint and become systemically unaffordable in its house prices, will cease to grow as fast as it was previously. I think Phoenix has done most of the rapid growing that it is going to do, unless some way is found to break the impasse of government monopoly land ownership surrounding it. I don't see Riverside-San Bernardino sustaining its growth rate either, given California's anti-growth culture. The tendency for cities to adopt anti-growth regulations means that the remaining ones that do not have these regulations should grow even faster. I would be surprised and dismayed if Texas and the Carolinas ever lost their pro-growth culture.